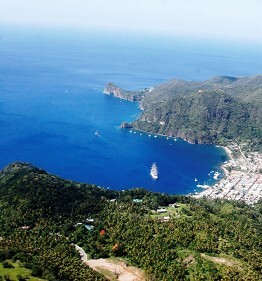 Sailing north through the Grenadine Islands and on to lovely St. Lucia. Ports may vary, depending on wind and the Captain's whim. 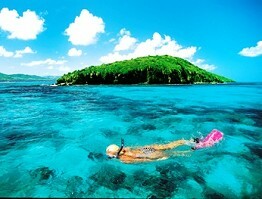 The best way to appreciate the Grenadines is by sailing there. The itinerary may vary slightly depending on the weather. The region is visited by only a handful of 'yachties' in search of eternal summer, making these islands one of the most exclusive sailing grounds in the world. Sprinkled in the crystal clear waters between the volcanic peaks of St. Vincent and Grenada is a 60-mile trail of palm-studded sandbars, coral reefs and tiny islets that haven't changed much since Columbus first sailed these waters. Our ships can sail right up to an islet and anchor of a deserted beach. You can ride the tender ashore, or just jump from the Mandalay and swim to the beach. 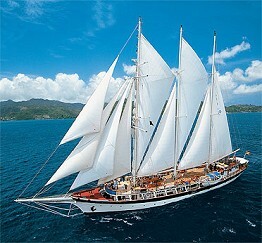 Enjoy the ultimate beach day until your Captain gives the cue to hoist sails. If it's nightlife and cultural stimulation you desire, Grenada and St. Vincent have just that, plus excellent beaches, lush rainforests and all kinds of water sports.